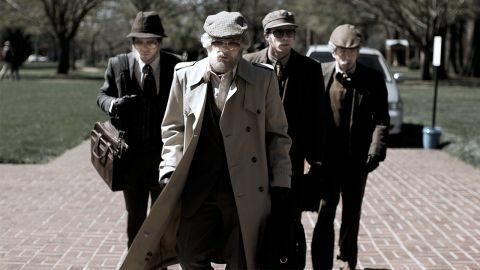 American Animals review: "Layton's hybrid style comes into its own"
Running from entertaining to tense as hell, Layton’s docu-drama heist flick grapples with something that most capers can’t even begin to compute: consequences. If, as the saying goes, film is a series of lies that combine to tell the truth, Bart Layton is muddying the waters. The British writer/director made his name in TV docs before unleashing 2012’s The Imposter, an incredible true story about the slippery nature of truth – and stories. Its USP was risky, interspersing talking-head confessions with gorgeously shot reconstructions that might have been taken from a regular thriller. But what emerged was a triumph, spearheading a new breed of streamlined, multiplex-friendly documentaries, such as Man on Wire. For this belated follow-up, the (true) story of four American students who plotted to steal priceless books from their university library, Layton moves one step further away from straight documentary. Most of what we see is a dramatic re-enactment of real events, but every now and then he cuts away to genuine interviews with the real people involved. How’s that for muddy? As a mischievous statement of intent, the film opens with the legend, “This is not based on a true story.” But then the middle words melt away to read, “This is a true story.” We’re then plunged into preparations for the robbery, watching Spencer (Barry Keoghan), Warren (Evan Peters), Chas (Blake Jenner) and Eric (Jared Abrahamson) applying old-age make-up as the score booms like an oncoming coronary. Just as things are getting tasty, Layton cuts to Warren’s (actual) dad, an ordinary guy sitting in his ordinary lounge. “There was a moment when we lost them,” he says, before bursting into tears. Anyone not hooked at this point should probably find a new hobby. Spinning back 18 months, the film introduces us to sensitive Spencer and wild-card Warren, bored teenagers desperate for something – anything – to happen. In the spirit of adventure, they start plotting the robbery, staking out the location and getting the gang together. Trouble is, they’re rubbish at it. Unlike his protagonists, Layton pulls off some deft manoeuvres here, mining the tension between the amusing amateurism of our heroes and the heart-pounding drama of the heist. It’s not the only interesting juxtaposition. As the boys take notes from classic thrillers such as Thief, Matchstick Men and The Killing, the real Spencer and Warren criticise the telling of their own story. “So this is how you remember it?” fictional Warren asks real Warren. “Not exactly,” he replies. These aren’t bad kids – or stupid ones – just characters waiting for their own inciting incidents. To begin with, the cloak and dagger stuff is all fun and games. Then, as the day approaches, it begins to gain a terrible weight. It’s here that Layton’s hybrid style comes into its own. Watching the real Spencer and Warren coming to terms with their actions adds an unexpectedly moving, moral dimension. “There’s no real getting past it,” decides the (real) Warren. Viewers of this extraordinary docu-drama may well feel the same.